Or 4 x $5 easy payments interest free with Afterpay. The Kleva mutlipurpose hanging organiser stores your booms, mops, tools and more. It easily organises cluttered cupboards and utility rooms storing all your equipment in one place. KLEVA MULTIPURPOSE HANGING ORGANISER, THE PERFECT WAY TO STORE YOUR BROOMS, MOPS, TOOLS AND MORE! 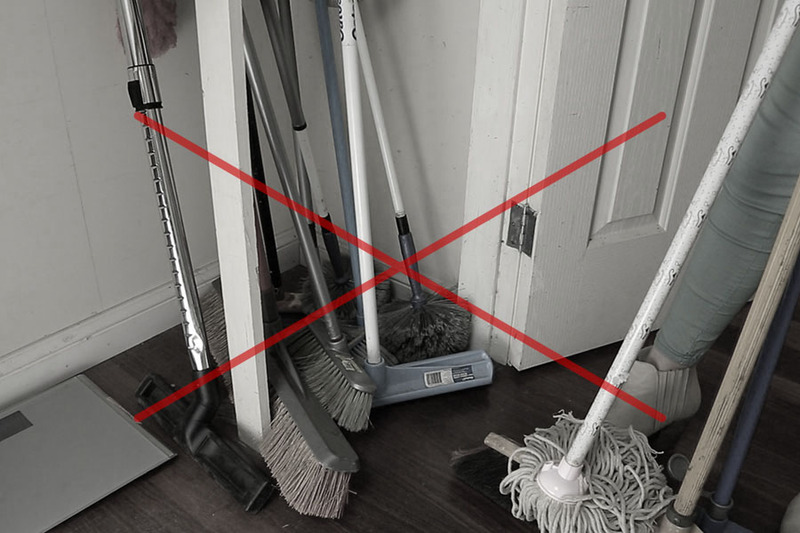 Are you fed up with having a messy broom cupboard? Or working your way around a maze of tools in the garden shed? Make sure that you get your poles in order with the Kleva Multipurpose Hanging Organiser! It’s designed to neatly store your mops, broom or garden tools. With our Multipurpose Organiser you can easily locate your tools and cleaning products and give them the home they deserve! Do you have too many brooms lying around the house and the garden? Are you having to nail too many hooks into the walls to make space? The Kleva Multipurpose Hanging Organiser allows you not only to hang your brooms, mops and garden tools but the six foldable hooks make it perfect for hanging coats, jackets, gloves or anything you wish to hang. If you don’t need them then simply fold them away! Using the Kleva Multipurpose Hanging Organiser makes storing your items easier than ever! Once you have followed the four step ‘easy install’ instructions on the box the Kleva Multipurpose Hanging Organiser is ready to go! 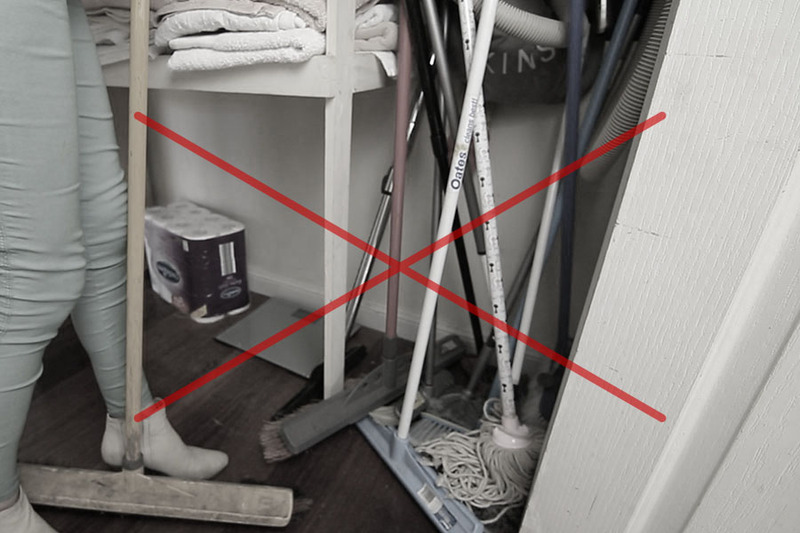 Just push the pole of your broom, mop or garden tool into one of the instant-grip slots and that’s it and your items are safely stored for when you next need them. Get yours now from the Kleva Range! There’s no need to let your poled items get the better of you! The Kleva Multipurpose Hanging Organiser lets you clear those walkways and your head, sit back and relax knowing that everything is where it should be. Simply screw the holder on to your wall using the screw hole guides, to keep your items secured safetly on to the wall. All of your equipment is protected with the rubber cushion grips that prevent scratching or damage to your tools. Everything Neat & Tidy, & YOU know where they are, at LAST. GREAT to know where the cleaning things are, A Mere Male but the work has still to be DONE. ENJOY, GREAT PRODUCT.[KLEVA]. THANKYOU. Great for storing my gardening tools in the garage !!!! Miracle Magnetic Duster BUY 1 Get 1 FREE Plus 2 FREE Extension Poles! Twin Pack! NO SCREWS, NO NAILS No Scratch Kitchen and Bathroom Hook REUSABLE! UNBLOCK Slow Drains NOW - YOU WILL BE AMAZED AT WHAT IT FINDS! 2 Pack!